Navigate your way to the right decision with this helpful guide on chartering a boat on Ibiza. One of the best ways to see Ibiza is by boat. You can discover coastal treasures of natural beauty, see amazing landmarks not normally visible and generally see some truly stunning sights when on the water. It's a world away from what you see by land and makes you fall in love with the island even more. There's a lot of choice of boats you can charter and it can be hard to choose one that's right for you. Depending on where you're going, for how long or how much you can afford, you want to make sure you make a choice that is right for you and your group. Luckily, Ibiza Spotlight is on hand to steer your choice in the right direction to make sure you're anchored in for a fantastic adventure on the water. Here is our guide on all the essentials you need. So many boats, but which one is for you? From gliding catamarans to powerful speedboats, the options are endless. Choosing the right vessel for your trip depends on many things. Speedboats are the perfect way to travel fast and in style. Pack your tightest swimwear and cut through the waves like Daniel Craig for a day. If you're looking to make a statement, speedboats are how to do it. For the eco-friendly captains out there, sailing yachts are the ones for you. Let the wind take control as the boat glides across the water. Large vessels can hold up to 12 people, which is perfect for a large group of friends or family. Semi-rigid boats allow for a more intimate experience. With these, you can be your own captain and take hold of the wheel, as these boats usually don't require a licence. Get out and explore the island's coast for yourself and at a lower cost. Luxury yachts are the way to go, especially if your idea of being on the waves is more about having fun and not having to lift a finger. The per-person cost is often not that high too. Many are like opulence personified, where you can sit back and relax on the deck with a cold glass of wine or a beer, be served a gorgeous meal and feel like minor European royalty for the day. Just be prepared for extra fuel charges. Faster boats require more, so talk with your charter rep about any costs to find which one is right for your budget. Ibiza is a treasure chest of hidden gems; many of which can only be discovered by boat. Nestled next to Spain, just below Mallorca in the Balearic sea, the island is surrounded by calming azure waters. See amazing coastal rock formations in sandstone or lime, beautiful bays and hidden pirate caves. It's a visual delight. Ibiza's coast can be explored easily in the summer months, with little more than a weak easterly wind. Seeing the entirety of it might be better on a one-week charter, though for most people we'd suggest picking a smaller route which can be done during a day. Either way, you want to be able to see everything at your leisure with stops to see things up close. Deciding where to go can be tough, but rest assured, whichever choice you do make, it will be rewarding. You can reach the paradise of Formentera in under an hour from Ibiza Town on most boats. Its beaches can only be described as pure bliss and it's no surprise that they are regarded as being amongst some of the best in the world. Sail your way to the islet of Espalmador - a favourite of celebrities and the super-rich – for a swim in its crystal-clear waters. Or you could set the anchor by Playa Illetes and dine on fresh seafood and paella at world-famous restaurants like Juan y Andrea. Formentera is a must for any holidaymaker. The north of Ibiza is another popular destination. Wild and wonderful, you'll find hdden beaches, and islets and be met with a fresh smell of nature from the gorgeous pine forests that grow next to cliff edges. After a trip to the north, head over to the west in the evening and take in a magical view of the sunset. Or you could always charter a boat overnight and enjoy the sunrise over the ocean whilst Ibiza Town awakens on the other side of the island. The islet of Es Vedra is another popular destination for nautical adventures. Its mystery and awe-inspiring views will leave you open-mouthed. There are a lot of options. With most charters, expert skippers will be able to share their knowledge of the island and take you to locations few know about. Exploring and even relaxing takes up energy. Holidays are also about indulging in fine food and maybe the odd drink or two. The high-end yachts will be kitted out with a kitchen and dining area and have on-board chefs that will prepare you some delicious food. If you have a licence and are taking the boat out yourself, then seek out the local markets and rustle up a fine and fresh seafood lunch with local ingredients. Ibiza and Formentera have some fantastic restaurants by the sea. You can even moor right outside as many if them offer a boat service, bringing you a gourmet lunch to you via dinghy. Now that's what we call a take-away. On some you have the option of taking your own food, so make sure you do stock up before going and check the boat has a big enough fridge to store everything so it stays fresh for when you are ready to eat. Some charters provide food, snacks and drinks either as part of the price or as an added extra. Be sure to find out what is offered and state any dietary requirements beforehand. Ibiza is celebrated as one the world's premier entertainment destinations. It should only be right that your charter trip is packed full of fun and interesting things to do. For party-goers, some boats are kitted out with a booming sound system, should you want to dance in the sun before heading to a super-club in the evening. Just be mindful of those around you though. A lot of charter companies offer snorkelling equipment, paddleboards or even water toys like jet skis or the seabob, on which you can do your own propelled journey over and under the water. Always check what's included with your boat as more expensive items may cost more, whilst some come as part of the price. We hope our guide helps you to decide on the best boat for you. 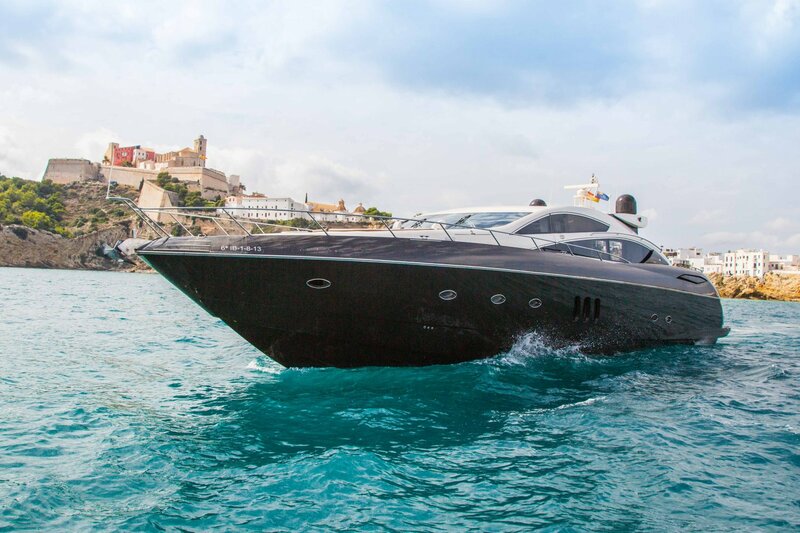 Ibiza Spotlight's boat charters' page has options on the main types of boats available, so head on over there. Happy sailing.